Kara Robertson of Swim Las Vegas keeps growing in the middle of the American southwest desert. This weekend, Kara and crew attracted 265 competitors to an oasis in the American desert. 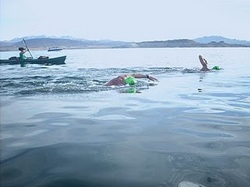 The swimmers, along with 85 water craft and 50 volunteers, went to Lake Mead National Recreation Area for the 2nd Annual Slam The Dam Open Water Swim where four countries, 17 states and 41 U.S. Master Swimming teams were represented. The field represented athletes from all ages and walks of life. 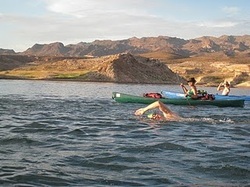 It's the biggest open water swim in Southern Nevada by a dam site. Swimming, you might ask? In the desert? 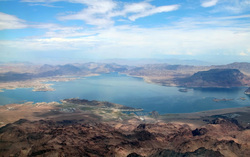 The second annual Slam the Dam open water swim zone championship is slated for Saturday at Lake Mead's Boulder Beach. 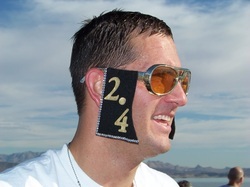 It's being hosted by Swim Las Vegas, Southern Nevada's largest U.S. Masters swim team. "Most people don't think of 'open water swimming' when they think of Las Vegas, but we'd like to change that," said Kara Robertson, race director. Race Review- Rachel Wagners blog. 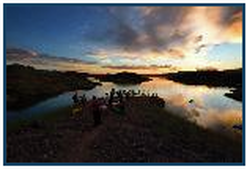 The Daily News of Open Water Swimming has listed Slam The Dam as one of America's "Bucket List" for open water swim events. Top male and female winners of the inaugural event,in the non-wetsuit category, will be posted with the International Marathon Swimming Hall of Fame. Early To Bed, Early to Rise, Early to Swim! THIS TO SAY about the inaugural event! Click Here to read his race report. Jason Smith, 3d place finisher of the Grand Slam @ Slam The Dam had THIS TO SAY about the inaugural event! Every endurance athlete is different in many ways, their natural ability, goals, technique, body composition and mental capacity. Each swimmer is coached according to and including all of these differences. A “One Size Fits All” approach is not used when training for endurance swimming; however, some basic/general concepts/methods will be incorporated and applied to every swimmer. The goal for endurance swimming is to maximize aerobic capacity, even if it means compromising muscular power and anaerobic capacity to a degree. Open Water (OW) endurance swimmers will swim far more miles/yards each week than a triathlete and a regular masters swimmer. The additional swimming each week will be at threshold and overload endurance training; however, the majority and most important part of training will be done at the basic endurance level. For competitive OW swimmers and serious distance swimmers a total volume of 60,000 yards/meters each week is standard.